If you've spent all weekend stuck in the house, not being able to get out because of the snowy weather, here are some top tips as to what to do to make sure that you can drive in the snow safely. After all, telematics insurance company Insure The Box has revealed that accidents increase by 20% amongst drivers during the winter months, especially amongst young, inexperienced drivers who will not have faced many of the hazardous conditions that winter can bring with it, like snow, ice, and sun glare - as well as driving in the dark for longer. So, all of you who stayed at home at the weekend, or merely ventured out on foot to build a snowman, go sledding or arrange a snowball fight, may have been the clever ones. 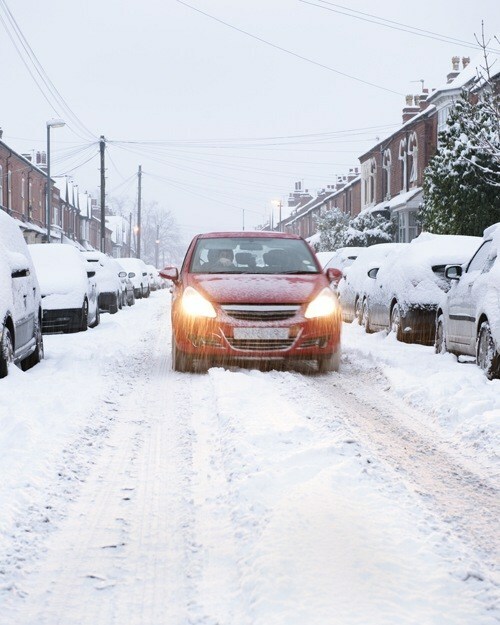 But there will come a time when you may have to venture out into snowy conditions, so we've taken a look at tips from Insure The Box as well as Head of Driving and Riding Advice at IAMRoadsmart Richard Gladman, and compiled a list for you to make sure that you drive in the snow safely and smartly. The best advice is to actually avoid travelling in extreme weather. Check the weather forecast before driving anywhere; unless the journey is absolutely necessary it could be safer to stay home. Because, in all honesty, if no one is moving out there on the roads, you are just adding to the problem - so listen to travel advice. If you do have to travel in bad weather, plan your journey thoroughly. As a nation, we have become too reliant on Sat-Navs to tell us where to go, but think about the number of times it has sent you down a country lane on a journey! These are the places to avoid as they are unlikely to be gritted (if the local council has got their finger out to grit the roads) so actually think about where you are going before you set off, and what the conditions are likely to be all the way along the journey. Before you set off, make sure that your vehicle is properly maintained. Make sure that your tyres are in good condition and inflated to the correct pressures. (Check out Tyresafe for more information on winter tyre safety). Make sure that the car's antifreeze is topped up, as well as your screenwash. And make sure that your windscreens, mirrors and lights are clean and clear. Also, clear off any snow that is on top of your car or bonnet as it can blow onto the windscreen when it falls. And clear it off of your lights - all of them! When you set off, start your car gently from stationary and avoid revving the car too much. Be aware that in extremely icy conditions, a manual car should be started in a higher gear rather than first gear - and, to avoid wheel spin, you should stay in that higher gear. Get your speed right in snow. It is obviously vitally important not to drive too fast because you risk losing control, but just as important is not to drive so slowly that you risk losing momentum when you have to drive up a slope. Drive to the conditions and "keep an appropriate distance from vehicles in front to enable you to manoeuvre should you experience a slide or skid." In fact, it is a good idea to increase the distance from other vehicles that you initially think you should be travelling at because when driving in snow (and on snow and ice) it can take up to 10 times as long to stop. Leaving more distance will give you "more time to slow down using engine braking which is less likely to induce a skid." And avoid harsh braking, and any sudden acceleration or steering. As you approach a bend, slow down even more to not only reduce the likelihood of a skid, but to also allow you time to react to anything that may be round the corner that you won't be aware of. "You should have finished slowing down before you start to turn the steering wheel." Use dipped headlights, even during daylight hours if you feel that it is necessary, as road visibility is much lower than in many other weather conditions. If you do get yourself stuck in snow, the way to extricate yourself (or try to at the very least) is to gently move your vehicle backwards and forwards using the highest gear you can. If you break down or have to pull over on a motorway or dual carriageway, as harsh the weather may be, it is best to leave your vehicle and stand to the safe side of it - but not in front of it, when waiting for help. When driving longer distances in these weather conditions, keep your vehicle well ventilated. It is easy to find yourself turning the heating up, but keeping the car too warm may actually make you too drowsy in the hot conditions, affecting your ability to drive safely. If you find yourself having to drive in wintry conditions a lot of the time (perhaps because you live 'out in the sticks'), it is advisable that you should start carrying the following pieces of winter car kit as soon as the cold weather starts: Thermal blanket, a warm change of clothes (including boots), spare sunglasses, emergency money in change, a spare flashlight (maybe consider a wind-up one), a spare ice-scraper, a spare phone or phone battery, a road map, a small shovel, sawdust or cat litter (to help wheel traction if required), jump cables, a first aid kit (including an extra supply of any medication you take), bottled water, and cereal bars. You can find more winter driving tips in Nationwide Vehicle Contracts' Winter Vehicle Car Guide here. Let's leave the final word to Richard Gladman of IAM RoadSmart. "Many of the problems associated with travel during snow could be avoided if people planned in advance. People routinely travel with only the minimum of safety equipment, without realising their journey could be a lot longer than expected. [All the points above] all might sound obvious, but too many of us forget to do any of this. Don’t be one of the ill-prepared, and listen to the weather forecast for the whole length of a winter journey to help you prepare for it."